The recent Russian and Chinese vetos of a UN Security Council resolution on Syria have been condemned in the strongest terms by Western diplomats — Hillary Clinton called it a 'travesty' and the US ambassador to the UN, Susan Rice, tweeted her 'disgust' at the way events had proceeded. At first glance, the reasons for the Russian veto seem obvious. Russia has important material interests in Assad's Syria: it continues to make major arms sales to the Assad regime — mainly high-end weaponry such as anti-air defence systems — and Syria hosts the only Russian naval base outside the former Soviet Union, at Tartus. Furthermore, the Medvedev/Putin administration, itself beset by domestic political protest, has little interest in promoting norms of international censure and intervention into contested — even violent — political situations. So it is easy to view the Russian veto as merely the outcome of a cynically realist assessment of its interests by the Russian regime. And, of course, it is in part. But it is not only the Medvedev/Putin regime and its apparatchiks that maintain this position. There are other actors involved in communicating and sustaining Russian opposition to military intervention or orchestrated regime change in Syria, most notably the Patriarch of Moscow and All Russia, Kirill. Kirill visited Syria in November last year, ostensibly to renew contact with the Syriac Orthodox Church and its leader, Ignatius IV, Patriarch of the Great Antioch and All the East. There is an important historical context for this visit. Russia's connections with Syria run deeper than mere contemporary strategic interest. Russian interest in Syria and in the broader Middle East stems also from Russia's historical conception of itself as the protector of eastern Christians. The Crimean War was sparked in part because of Russia's intervention in the Ottoman Empire on behalf of Orthodox pilgrims and religious communities. Catherine the Great, Nicolas I and an assortment of 19th century Russian intellectual and cultural figures planned or advocated a Russian occupation of Constantinople as a means of re-establishing and reviving Christian life in the east — Byzantium would be restored and Russia would lead this enterprise. And so, with this history not entirely forgotten, Kirill to Damascus. Kirill praised the relationship between the Syrian regime and the Syriac Orthodox Church and expressed anxiety about the implications of the 'crisis' in the Middle East for minority communities, particularly Christians. His concern is well founded. The number of Christians in Middle Eastern communities is declining, via emigration under pressure of actual or justifiably feared violence and political and socio-economic marginalisation — the heirs of Byzantium, the Christian communities of the east, are in decline. So, in Syria, where relations between Christian and Muslim communities have been relatively harmonious, and where Christians have been afforded a comparatively secure place in communal life, Kirill's concern has been that, were the Sunni Muslim majority to assume political power commensurate with its size, this balance might be upset. Again, this concern is justified. In Iraq the re-balancing of political power after the 2003 US-led invasion led to the mass exodus of Christians as violence and sectarian strife threatened their communities. In Syria minorities such as the Alawis, Ismaelis, Byzantine Christians and Maronites foresee the Islamisation of the Syrian state if the Assad regime were to fall. As Fr Paolo Dall'Oglio, head of the Syrian monastery of Mar Musa al Habashi has emphasised, for many Christians and other minorities, the Assad regime has been perceived as a kind of secular state offering the possibility of inclusion and advancement. Thus the widespread support among these groups for the idea of more gradual political reform undertaken while Assad remains in power. This is not to say support for the regime or for the resistance is neatly divided along confessional lines — on the contrary, while some Christians support the Assad regime, others are equally committed to ending it. Nonetheless, for many members of minority communities, the crisis raises questions about their position in a reshaped Syrian state. What's more, as Dall'Oglio has pointed out, the conflict in Syria is connected to broader conflicts in the region, including between Turkey and Iran, the US and Russia, Sunnis and Shiites, and between the secular conception of the state and a religious vision of society. Violence and discord has promoted the emergence of 'specific geographical identities' that hitherto had remained dormant and which threaten Syria with fragmentation in the event that some form of political consensus is not achieved. Is it possible that the Russian position as expressed by Kirill reflects some of this complexity? It is obvious that during his Syrian visit Kirill to some extent echoed the rhetoric of the Russian state. In calling for non-intervention in Syrian domestic affairs his language echoed the language employed recently by Russian diplomats at the UN Security Council. He made some highly dubious gestures, including presenting Assad with a chalice made by craftsmen in the Urals — in symbolic terms, handing Assad the mantle of 'protector of the faith'. Making gestures of this kind while Assad directs violence against his own people is plainly the wrong, not to mention unwise, thing to do. Nevertheless, Kirill's visit draws attention to some of the complex issues involved in considering political reform in Syria. While Russian diplomats may be less convincing, the position expressed by Kirill against any immediate move to depose Assad reflects serious concerns. The Moscow Patriarchate's official statement about the visit reiterated Kirill's worry that the rise of religious radicalism in the Middle East would 'threaten the integrity of the Arab world'. By integrity, he meant the capacity for Arab countries to incorporate their various rich cultural and religious traditions equally into the fabric of the national community. The themes Kirill emphasised serve as a reminder of the many different social and religious groups that would have to be incorporated meaningfully in any post-Assad political arrangements. Benedict Coleridge is a recent honours graduate at the University of Melbourne. Thank you Benedict for this very helpful analysis. It is of profound concern that the Christian minorities (mainly Orthodox or in union with Rome) in the Middle East are under such pressure from extremist Islamist and Wahhabist elements in the 'liberation' movements. Your article highlights material that the mainstream media misses because it is simply ignorant. Thanks very much for this contemporary context and analysis Benedict. The recent visit by Kirill is indeed interesting. We understand that many international powers understand that Syria's geopolitical position, social composition and political leadership mean any 'settlement' will need more nuanced steps. And as you note it is not only Christians that are potentially under the hammer. Importantly, Syria is run by a shia/Alawite minority which, like other shia groups across the Middle East - and indeed the Gulf, South and Central Asia, do not sit easily with many majority sunnis. Russia is in the box seat to play a large role in pushing for and helping manage a power transition. However, we are not clear if that is on the agenda. The future, for all in Syria and especially its minorities, is deeply worrying. It would be good to hear from you again further down the track Benedict. A good article which highlights that not everything is as our media makes us believe. A democracy can only flourish if respect between different religions, races and political philosophies exists. Out of tolerance and respect democracy can grow. I would generally agree with Paul Collins's comments about the merits of Bendict's article. However, I doubt he is correct when writes that the mainstream media is ignorant of it. I would suspect that it is more likely that they choose not to print it. I hasten to add that Eureka Street itself has been slow to highlight the persecution of Christian, and other minorities, in Muslim lands. I suspect the reason for this is that many of the writers here, and in the MSM, are more comfortable writing on the theme of "Muslims as victims". I have seen far more articles here on the rights of Muslim women to wear the hijab in Australia than I have of Christian girls in the Middle East who have been kidnapped and forced to convert to Islam. This article is a welcome change. I look forward to more highlighting and examining the reasons behind the great suffering and persecution many minorities are suffering in Muslim lands as the so-called "Arab Spring" gathers momentum. Thank you for fleshing out the complex background and history to this present struggle, little of which is identifed at the least - much less analysed, in the mainstream media. Much appreciated. Benedict Coleridge's article shows that international relationships can be complicated and we should not jump to simplistic conclusions. It also a reminder that religious beliefs and allegiances can be significant in politics and can cause difficulties, even wars. Now that the world has grown 'smaller' there is an increasing need for tolerance between adherents of different religions (and those of none) if we are to live in harmony - internationally; and within each country. A good article, Benedict. Ignatius IV is actually the Greek Orthodox Patriarch of Antioch. The Syriac Orthodox are an non-Chalcedonian church, similar to the Copts and Armenians. 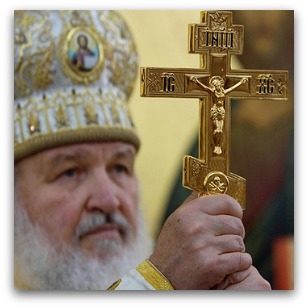 Patriarch Kyril would visit his own counterpart, not the Syriac Patriarch. Patriarch Ignatius is the head of the Antiochian Orthodox Church (aka Greek Orthodox Church of Antioch) as opposed to the Syriac Orthodox Church. The Syriac/n Ortodox Church Of Antioch 37 A.D Is the Mother church of all the churches of all the world, Patriarch Ignatius Zakka is Petrus the apostel on earth, The people of the Syriac Ortodox church speak Aramaic and have a Aramaic identity, Case close....We dont care if Assad sits or not, All this what is happening in the world is written in the holy books, So let it all come to pass so that our lord can come quick to make everybody pay for what they have done to the people on the Rock that his church is build. Oh Kepa(Petrus) on you shall my church be build, Zakka is the 132 Patriarch after Petrus. I am amazed how many comments were made in regards to godly apartheid. If people in 2012 still argue if somebody is a member of Antiochian Orthodox Church or Syriac Orthodox Church or Russian Orthodox Church or may be affiliated with Rome, then what hope has Christianity? If Christians are unable to tolerate each other is it a wonder if other forces start nibbling at the edges of the squabbling holy fight club? My correction of 'Syriac Orthodox' was meant for clarification as to why the Moscow Patriarchate would support a member of the same family of churches. The vast majority of Christians in Syria belong to various Eastern Church groups of which the Orthodox are the largest. Benedict did point out the fact that Russia has an extremely important naval base at Tartus. The Moscow Patriarchate was very supportive of Russian foreign policy in Soviet times. Politics and religion could once again be united here. The situation for Syrian Christians is currently quite grim as there are reports of some beheadings of Christians (and Alawis) by Sunni insurgents.